Cloudy and windy this morning, becoming partly cloudy this afternoon. A stray shower or thunderstorm is possible. High 61F. Winds N at 20 to 30 mph, becoming SE and decreasing to 10 to 15 mph.. Partly cloudy. A stray shower or thunderstorm is possible. Low 39F. Winds SE at 10 to 15 mph. The Colorado Springs Police Department, Fountain Police Department, and the El Paso County Sheriff’s Office will host the fifth annual Pikes Peak Regional Law Enforcement Teen Academy June 3-7. The Teen Academy provides young adults with a unique opportunity to learn about the operations of regional law enforcement agencies in El Paso County. Some of the courses will include jail operations, SWAT, K-9, the Explosives unit, criminal investigations, and search and rescue. Participants will also tour the secure areas within the Criminal Justice Center (county jail), the evidence facility, and courtrooms at the Terry R. Harris Judicial Complex. The Academy will run June 3-7 from 9 a.m. to 4 p.m. at the Southeast & Armed Services YMCA, 2190 Jet Wing Drive. Interested applicants must be between the ages of 13-17 by May 15 to be eligible. Applicants must also be El Paso County residents and currently enrolled in or recently graduated from a school in El Paso County. Applications must be printed, completed, and received by May 15 at 3 p.m. Please note, the “Academy Participation Liability Waiver and Indemnification Agreement” must be signed in the presence of a Notary Public. Notary Public services for the Teen Academy may be obtained at any of the CSPD police stations at no cost. For additional information or questions, contact Officer J. Kuhn at 444-7410 or cspdcommunityrelations@springsgov.com. The application can be found at tinyurl.com/yy4m6vb6. About 50 children have been practicing the song, and young singers will perform at several events around the County this month. 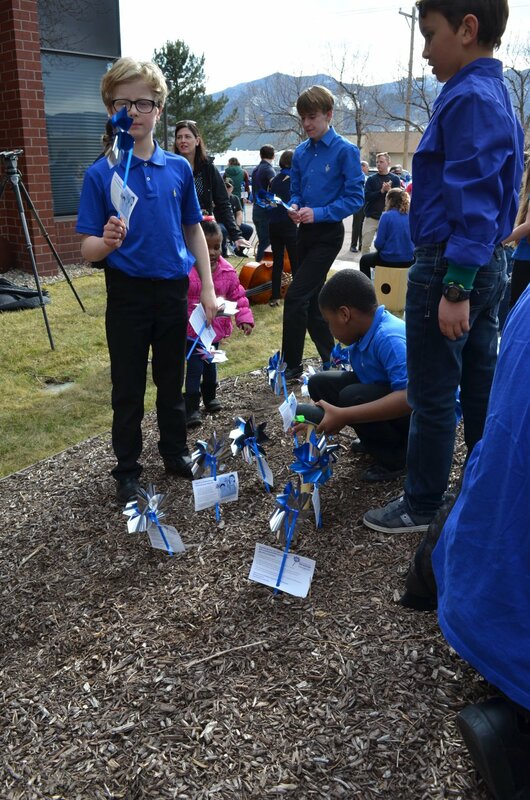 Communities across the state are planting pinwheel gardens and wearing blue as the sign of collective commitment to prevent child abuse and neglect.